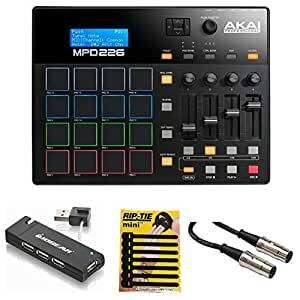 The Akai Professional MPD226 USB Controller combines a pad controller with a control surface in a lightweight and compact package, offering producers, programmers, musicians and DJs the feel of classic MPC beat-making. Sixteen ultra-sensitive Thick Fat MPC pads are used to trigger drum hits and other samples in your software or external MIDI sound module. They are backlit for visual feedback & color-coding, and pressure- and velocity-sensitive for a responsive feel and intuitive playing. You can switch between four pad banks to control up to 64 samples. The control surface features four 360Â° knobs, four buttons, and four faders (all assignable) which send continuous controller messages to the software for up to 36 parameters stored in three independent control banks. The unit incorporates some of the MPC’s most popular features such as Full-Level button, MPC Swing, 16-Level button, Note-Repeat button, and Tap-Tempo button. The MIDI In/Out ports allow for connecting the controller to external MIDI devices like synthesizers, sequencers and drum machines. The MPD226 is class-compliant with Mac and Windows, and is iOS-compatible via Apple’s Camera Connection kit (available separately). It comes with a comprehensive software bundle which includes, Akai Pro MPC Essentials, Sonivox Big Bang Cinematic Percussion & Big Bang Universal Drums, and Ableton Live Lite.